When your website is ready, the next step is to make it live globally, right? For that, you will need a web hosting provider from whom you can purchase the web hosting plan for your website. While choosing the plan, you will get two options: Managed and Unmanaged hosting. 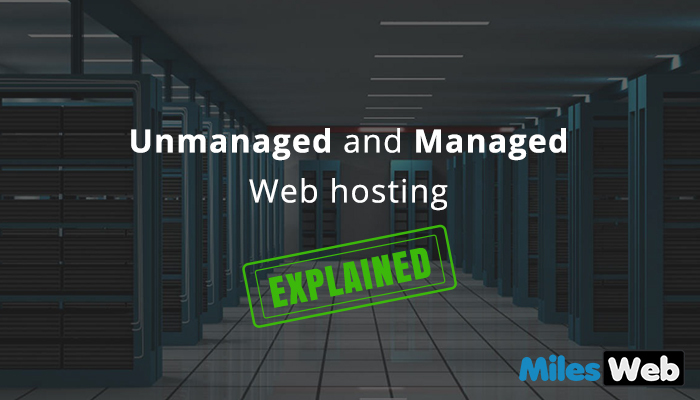 If you are aware of these terms then it will become easy to buy the plan, but in case you are a newbie, then knowing the difference between managed and unmanaged servers can help you a lot. A hosting plan comprises of various components and the main ones are the server and hardware. Generally, any hosting plan consists of servers, operating system, email account, SSL certificate and more. Once you have finalized your plan, your hosting provider will set up your account on a preferred location. Managed hosting means managing all the activities of the server, which is an ultimate responsibility of the hosting provider. There are multiple activities that providers perform, such as monitoring server performance, security, backups, malware removal, customer support, updates, SSL installations and more. As I said before, your account is set up by the provider on the server and the server itself comes with an installed operating system and software like cPanel, Plesk, WHM, etc. In short, your complete work is managed by the provider and you can focus on your business development. If you are asking the provider to manage all the activities on your behalf, then in return you have to pay the heavy amount to the provider, therefore, managed hosting is the quite expensive solution. Moreover, there are some providers that offer a hosting service specially designed to run WordPress that again make your website more reliable and faster. If you are looking for Managed WordPress hosting then no need to worry because MilesWeb Cheap WordPress hosting plan is the perfect solution for your WordPress site. They are India’s first hosting company to partner with Jetpack. By availing the superior features of Jetpack you can improve the performance of the website. First and foremost activity in managed hosting is server monitoring. A server is continuously monitored to identify any potential failures. The aim behind monitoring the server is to avoid a major problem that is going to happen in future. You must have heard the famous quote, “prevention is better than cure”. In managed hosting, regular and in-depth observation of system admin has carried out that in return assures the maximum server uptime and network availability. Security is one of the main constraints that every hosting provider looks after and provides tons of security features to overcome security issues. A hosting provider scans operating system and core application to search vulnerabilities. List of server security is never ending as it covers various aspects such as running security audits, spam filtering, virus scanning, software firewall configuration, OS updates, etc. No matter what is the size of the company, but in terms of storage, company requirement may get changed all the time. The amount of space required by a firm at the start won’t be the same in the future. For sufficient storage, it is necessary to the monitor storage capacity by maintaining the right balance of current and future storage requirement. Managed storage denotes outsourcing a company’s storage requirement from a managed service provider. This is one of the superior factors for the company because it helps to decrease the cost related to purchasing and regulate storage services. Un-managed hosting, on the other hand, allows you to manage your server as per your need. Here you get a complete response to manage the server right from installing to monitoring etc. Your hosting provider is not responsible to manage the service on your behalf, they only provide the service and rest is your lookout. In short, if you belong to the technical background and ability to manage all issues and other server related activities on your own then this is a good solution for your business. Now you must be wondering, why anyone will choose the unmanaged hosting service? The answer is quite simple because there are some companies that require customized software to run a business and unmanaged hosting service provides this flexibility to customize the software. Looking for Unlimited Web Hosting Plan? Why not try MilesWeb!! From above-mentioned features, you can ensure that your business is in safe hand. Moreover, they provide few paid services like SiteLock basic, Analytics Integration, Google Webmaster, etc. After considering all the above-mentioned things, it will become easy for you to select any type of hosting solution for your business. I will suggest you consider MilesWeb managed web hosting service that gives you complete root access to the server and quality customer support service as well.